The Bureau of Counterterrorism and Countering Violent Extremism (CT) at the United States (US) Department of State released its Country Reports on Terrorism for 2017 yesterday, 19 September 2018. 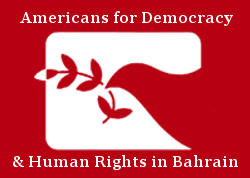 While the Bahrain country report again fails to address how key tenets of the kingdom’s anti-terror framework violate international law and are used to suppress nonviolent activism, Americans for Democracy & Human Rights in Bahrain (ADHRB) welcomes the State Department’s explicit criticism of the government’s intensified repression of civil society space. As Bahraini authorities continue to clampdown on all peaceful avenues for dissent – conflating criticism with terrorism – they are precluding sustainable reconciliation and reform efforts that alone can ensure stability. The State Department’s report finds that escalating government repression is a key risk factor driving instability and violence. In its introduction to the report, the CT Bureau asserts that “the closure of an independent newspaper [Al-Wasat] and two opposition political societies [Al-Wefaq and Wa’ad] along with government suppression of peaceful protests have combined to exacerbate political tensions, which could increase the risk of radicalization to violence.” Bahraini authorities arbitrarily suspended Al-Wasat, the kingdom’s only major newspaper without connections to the government, in June 2017, ultimately forcing it to close. In 2016, 2017 and 2018, a series of legal proceedings resulted in the arbitrary closure of Bahrain’s two largest opposition groups, the predominantly Shia al-Wefaq National Islamic Society and the secular leftist Wa’ad National Democratic Action Society. Meanwhile, Bahrain’s police have continued to violently disperse peaceful demonstrations, culminating in a lethal raid on a sit-in that left five dead and hundreds injured in May 2017. The State Department specifically notes that “although government leaders often publicly speak about tolerance and reducing sectarian rhetoric,” Bahrain has “no overall strategic messaging campaign to counter terrorist narratives,” and “the government also dissolved secular opposition political group Waad and closed independent opposition-leaning newspaper Al Wasat, limiting the space for opposition voices in the country [sic].” Simultaneously, however, the report fails to acknowledge that the authorities have also taken virtually no steps to integrate the Shia majority into the security forces or to eliminate sectarian discrimination within the ranks, though it does point out that there remain no “published statistics on the … composition or track record” of the government’s much lauded “community police” – an unarmed unit purported to compensate for the extreme demographic imbalance. Repeating concerns from the 2016 report, the CT Bureau additionally warns that “the potential politicization of terrorism finance and money laundering issues risks conflating legitimate prosecutions of militants with politically motivated actions against the mainstream opposition. In May, the government convicted Shia cleric Isa Qassim on money-laundering charges related to his collection of khums, alms giving unique to the Shia sect, without proper authorization.” Sheikh Isa Qassim, the leading religious figure for Bahrain’s Shia community, was also arbitrarily stripped of his nationality by ministerial order, rendering him stateless in a move previously criticized by the State Department. Despite these important assessments, the State Department report declines to fully evaluate the two biggest changes to Bahrain’s anti-terror framework in 2017: a) the expansion of military court jurisdiction to civilians; and b) the restoration of law enforcement authority for the National Security Agency (NSA). The king signed a constitutional amendment in April 2017 allowing military courts of the Bahrain Defence Force (BDF) to “try civilians accused of threatening state security” – a move that violates both international law and the spirit of the Bahrain Independent Commission of Inquiry (BICI) reform package, which condemned the kingdom’s emergency military tribunals for rampant due process abuses in 2011. Since the amendment, a military court has already sentenced five civilians to death in a trial marred by torture and enforced disappearance that implicated BDF troops. Contemporaneously, in January 2017, the king reauthorized the NSA to conduct arrests, directly reversing a previously implemented BICI reform to strip the intelligence body of its powers after a series of violent abuses, including the extrajudicial killing of Al-Wasat’s cofounder, Karim Fakhrawi. The State Department simply notes these changes without any assessment of the obvious negative impact such regression has on Bahrain’s stability, let alone the campaign of state terror unleashed by the newly empowered NSA against activists and human rights defenders like Ebtisam al-Saegh. Moreover, the CT Bureau continuously refuses to acknowledge core problems with Bahrain’s anti-terror legislation, namely that its “overbroad” definition of terrorism is designed to encompass peaceful dissent. So long as such abusive legislation remains central to counterterrorism in Bahrain, and so long as abusive security services like the NSA and the Ministry of Interior (MOI) remain the lead enforcers of this strategy, the kingdom’s anti-terror efforts are necessarily applied against mainstream nonviolent civil society actors alongside fringe militants. There is substantial evidence that the Bahraini government purposefully conflates criticism with terrorism and misuses anti-terror discourse to defame and suppress leading human rights defenders or opposition activists. Bahrain itself reported to the United Nations that it convicted 7,460 people under the anti-terror law between 2011 and early 2018, and estimates indicate that the vast majority of the kingdom’s more than 4,000 current detainees are political prisoners charged under such repressive legislation. The CT Bureau rightly points out that the arbitrary dissolution of major opposition groups exacerbates political tensions, but it fails to address this larger problem of mass incarceration and systematic state violence in the name of counterterrorism. Moreover, it fails to acknowledge or investigate how the Bahraini government’s purposeful misuse of anti-terror frameworks distorts the scope of actual terrorism in the kingdom and undermines the efficacy of any real counterterror efforts. The State Department is right to draw a clear connection between government repression of civil society and the risk of increased instability in Bahrain. However, ADHRB remains concerned by its failure to fully assess the abusive consequences of Bahrain’s anti-terror legislation and the purposeful misapplication of anti-terror measures by security authorities. We call on the US Government to immediately suspend any and all assistance to abusive security institutions like the NSA and the MOI, and to pressure for necessary reforms identified in the CT Bureau’s report: specifically, to protect free press, restore dissolved opposition groups, and lift restrictions on the right to free expression and assembly.